My friend Ernest is pretty awesome. After realizing that the men in Chicago don’t always try to dress well, he’s challenging them to change their ways. Throughout the month of November, he’s dressing up each day and documenting his outfit. He’s also asking other men in the area to do the same, and posting their pictures. Now, okay, I’m not in Chicago, and I’m definitely not a male, but I found this to be a really awesome initiative. So, I decided to join. Throughout this month, I’m actually trying to dress well each day for work (even though we don’t have the slightest dress code). I’ll document my outfits on the blog. Samir is even joining in. 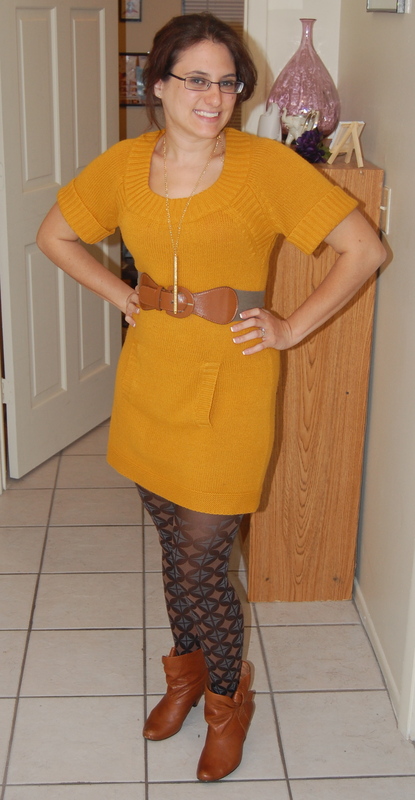 Dress: NY&Co., Belt: Target, Tights: gift, Shoes: hand-me-down. Samir got me the Joan Holloway pen/necklace for my birthday (which is today – I’m 27 – Yikes! ), so I decided to rock it. The dress I got a year ago, and it’s so incredibly comfortable I wear it as much as humanly possible without being disgusting. The tights Megan got me as a thank you gift for planning her bridal shower. They’re so hard to match, but so fun to wear. Okay, the outfit isn’t perfect, but it’s professional enough and I didn’t actually decide to engage in the challenge until an hour ago. So give me credit for the first day – tomorrow will be better. 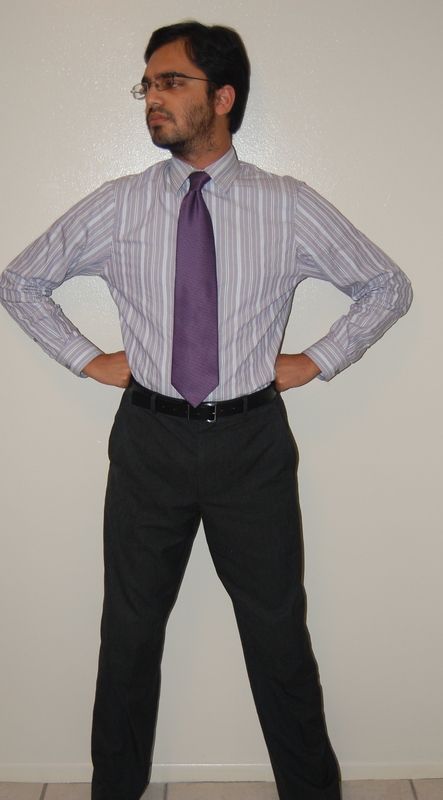 I like to call this Samir’s Chuck Bass ensemble. (We all know Bass loves purple). We got the pants a few weeks ago at GAP (thank you, Groupon, for the awesome discount). It’s so hard to find pants that fit Samir due to his height, but these are wonderful. We bought two pairs, we were that excited. Happy birthday, and the look is fab! I don’t recall the men in Chicago dressing much differently than the men in Florida (South Beach club scene aside) but it sounds fun. I wear shirts and ties every day. It’s actually easier for me to wear that than anything else.